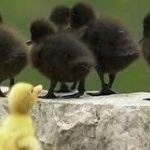 I remember this story of an ugly duckling who did not fit into her flock and often she used to consider herself ugly but that’s one perspective. May be the duck was not ugly and it was just a misfit and in the right flock or place she would have realized her potential and capability that could have proved her worth. Sometimes you are not ugly…rather you are looking into the wrong mirror..Change the mirror! !